Donna Grantis takes us through her history with the guitar, from learning her first song to going to jazz school to playing her Purple Rain solo with Prince. Donna Grantis was born to play guitar. Like a lot of people, Grantis started when she was a kid, but unlike a lot of people, she was a very quick study, maybe even virtuosic. Tellingly, the first song she ever taught herself to play was Led Zeppelin's Stairway to Heaven — in its entirety. For years, Grantis was one of the most sought after session players in Toronto, playing with the likes of Shakura S'aida, Amanda Marshall, Kardinall Offishall and more. But all that changed in 2012, when she received a message on behalf of one of her musical heroes. "I got an email that said, 'Hi, wondering if you'd be interested in coming to Paisley Park to jam with Prince in the band?'" she tells q's Tom Power. She did some digging online to make sure the person contacting her was legitimate, and after that it wasn't long before she found herself with a one-way ticket to Minneapolis, where Prince's home studio, Paisley Park, is based, armed with her guitar and a shortlist of songs she had learned, including classics like Purple Rain. The audition, as it turns out, was more like a jam session, with Grantis thrown directly into the mix with future 3rdeyegirl bandmates Hannah Welton and Ida Kristine. When they played Purple Rain, Grantis noticed Prince wasn't on his guitar, but instead played piano. And he was watching her play. When it came time for the solo, Prince simply gave her the signal that this was her moment. "It's really sink or swim, do or die," she says of working with Prince. "I always felt like, when I was on stage with Prince in the band and he would point to me or he would say, come on, Donna, you know, it's time to just go for it. Give it 100%." When asked what she takes away from her time working with Prince, she replies that it was the "totality of the experience." It's an experience that Grantis has brought to leading her own five-piece band. After four years playing and touring with Prince in both 3rdeyegirl and The New Power Generation, she's released her debut solo album, Diamonds & Dynamite, an eight-song collection of jazz-rock fusion inspired by not only her time with Prince, but also '70s era Miles Davis and motherhood. "I didn't want to be overly rehearsed because I wanted the other musicians to also be on their toes," she says. " I wanted to keep things fresh. I think when you're in that environment with musicians, first instinct really kicks in. And very often I think that's the best instinct to capture on record." 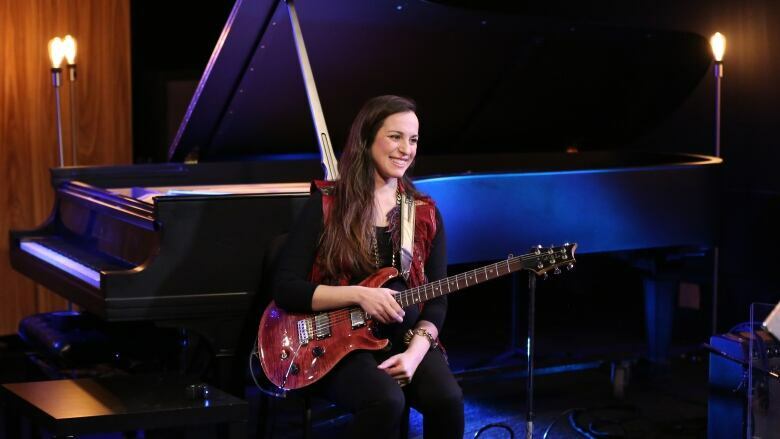 Grantis stopped by the q studio, guitar in hand, to perform special solo versions of two songs from her album, Mr Majestic and Diamonds & Dynamite. She also took us through her history with the guitar, from learning her first song to going to jazz school to playing that Purple Rain solo and what it means to her now. You can hear the interview by clicking listen up top, or watch an extended cut of the interview in the video above. Diamonds & Dynamite is available now. Watch her perform Mr Majestic and Diamonds & Dynamite below.